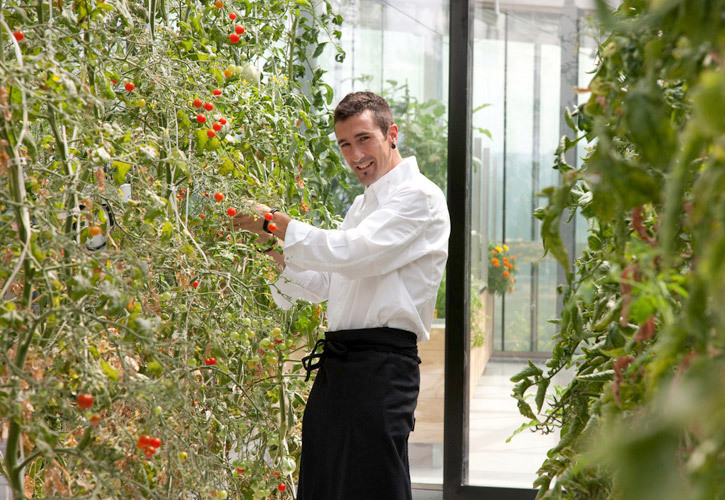 Modernist Chef Eneko Atxa not only delights diners with incredible dishes at his restaurant Azurmendi but also helps them understand exactly how important sustainability, quality, and supporting the local eco-scape is for him with a full tour of the facility. 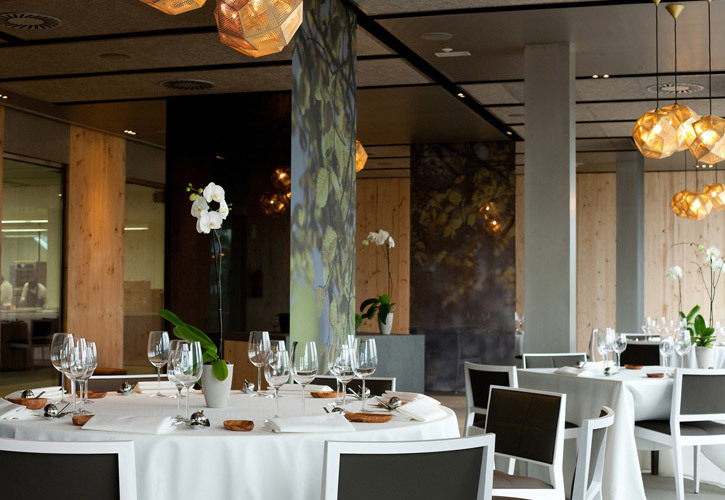 Chef Atxa strives to create a dining experience that respects the origins of the food and believes that scent and sight are just as important as flavor as means to that end. Though research is intense and techniques such as ultrasound or vacuum dehydration are used, no artificial flavors are created; the focus is always on getting the most natural flavor from each ingredient. 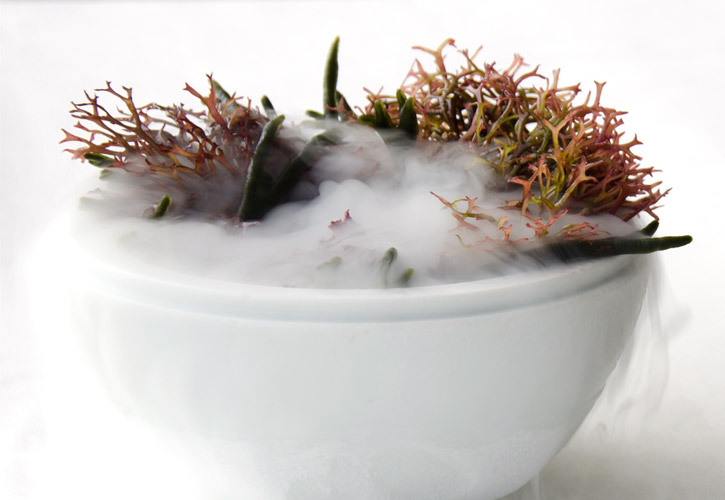 Learn what inspires him to create new dishes and what techniques he uses in his molecular gastronomy lab to enhance the dining experience. Technique is also important to Chef Atxa, especially the new ones that he develops by working with the University of the Basque Country in his research center, the on-site lab. “I think the new techniques are going to stay here forever. Some of what we call now traditional techniques that we use today used to be modern and revolutionary many years ago.” He believes that they don’t have to be visible and obvious, but they need to be there in o order to obtain the results that he desires. 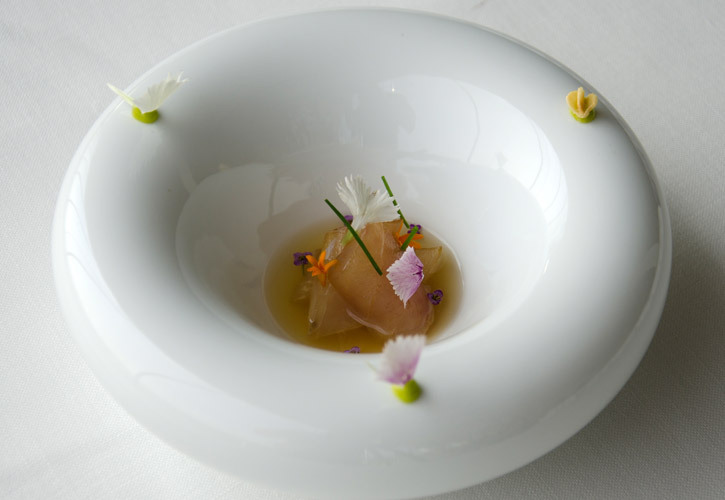 One of the most advanced techniques in molecular gastronomy, using ultrasound to change the properties of an element, is a flagship method at Azurmendi. 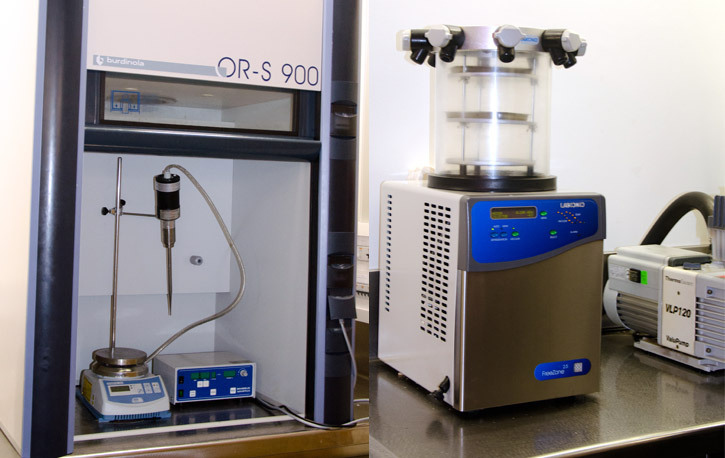 The machine uses different settings to modify physical properties without using heat or cold that can alter flavor. Instead, it uses microvibrations to exchange properties from a solid element to a liquid element, for example. Chef Atxa uses this method to infuse oil with garlic. Considering that the infusion process typically takes 4 months with the traditional method, being about to accomplish it in 45 minutes is a pretty big deal. Perhaps the best part of all is that Azurmendi’s infused oil was preferred in a blind taste test over the many commercial oils that were created using traditional methods. Ultrasonic and vacuum dehydrator shown below. 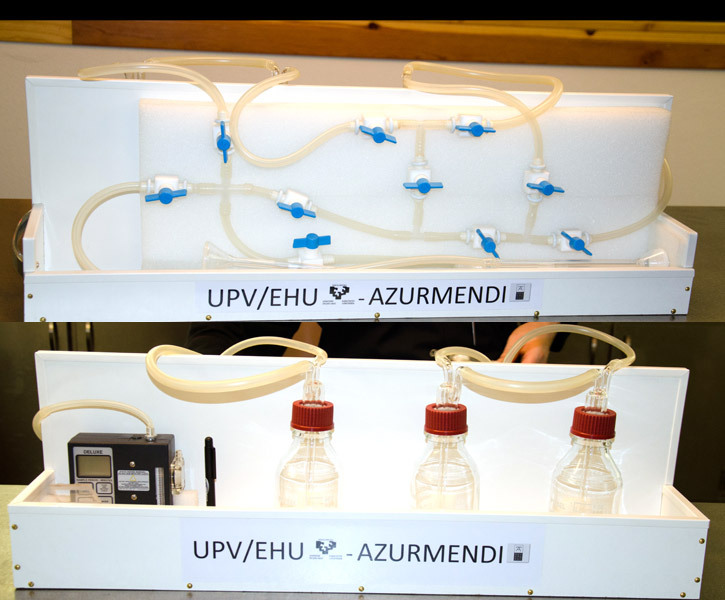 Another way that they use the ultrasound is to “bottle” the smell of seawater in order to enhance the dining experience of their guests. 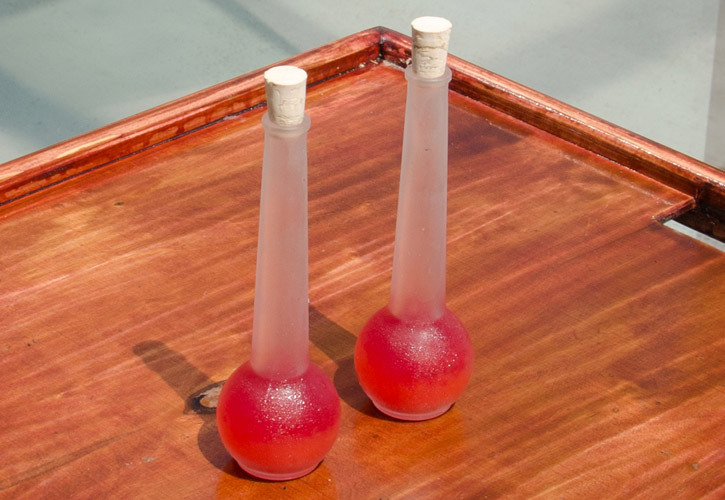 According to Chef Atxa, “The ocean water outside of its own environment loses its characteristic aromas because it is the particular elements of that ecosystem that generate that aroma. 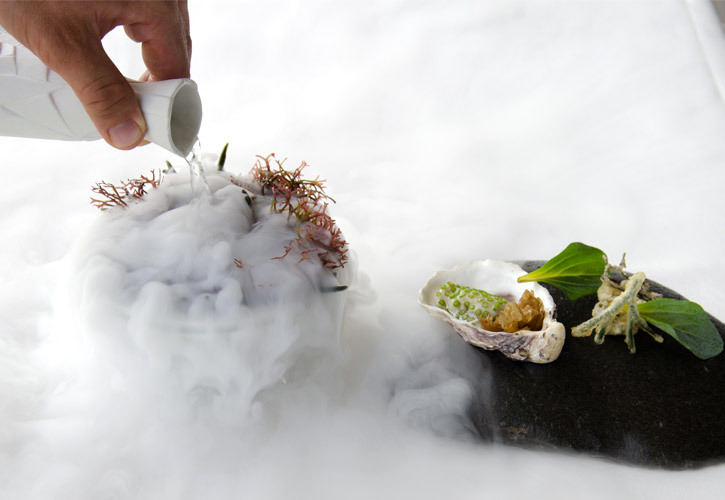 What we did is to bring together those different elements and using the ultrasound, transfer those aromas into the ocean water.” At the table, they release the aroma using dry ice to enhance dishes such as the Oyster with Sea Gel, Salicornia and Natural Aromas Extracted from the Sea. They’re also using prototype equipment in conjunction with the University of Basque Country to capture the aromas that are produced when you cut fresh herbs. They create air currents while cutting the herbs that actually capture the aromatic molecules released into the air during the process. Then they capture the air currents and trap them in a solution that is evaporated tableside to release the aromas of the fresh-cut herbs. Image shown below. 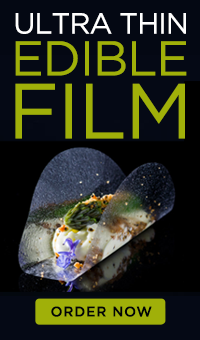 Without a doubt, the technology that Eneko Atxa and his crew are using will take molecular gastronomy to all new levels in the very near future! 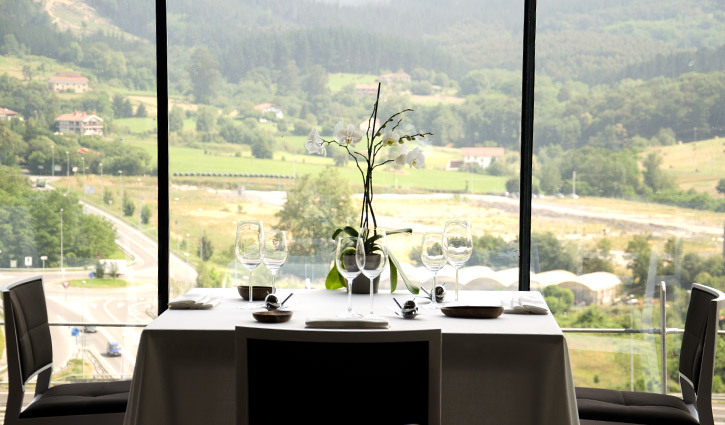 We recently had the pleasure of visiting Azurmendi and were pleasantly surprised to realize that a full tour was part of the experience for all diners. Since the building has been recognized as one of the most sustainable restaurants in Europe, this was a treat. Though the restaurant itself appears huge from the outside, it’s only arranged for 45 or so covers with ample space between tables. The rest of the building consists of the lab, the kitchen, the indoor greenhouse, and open garden. We were immediately greeted in the reception area and then asked if we’d like to go for a walk. We started at the top of the building where the greenhouse is. After being explained the different plant varieties and the automated processes to control the growing environment, a surprise amuse bouche awaited us. It consisted of a delicious rose petal with tomato emulsion and a beetroot macaroon on top of edible beetroot soil accompanied by a refreshing drink made with orange, grapefruit and hibiscus. It paired well with the wide-open feel that you get from the building itself. 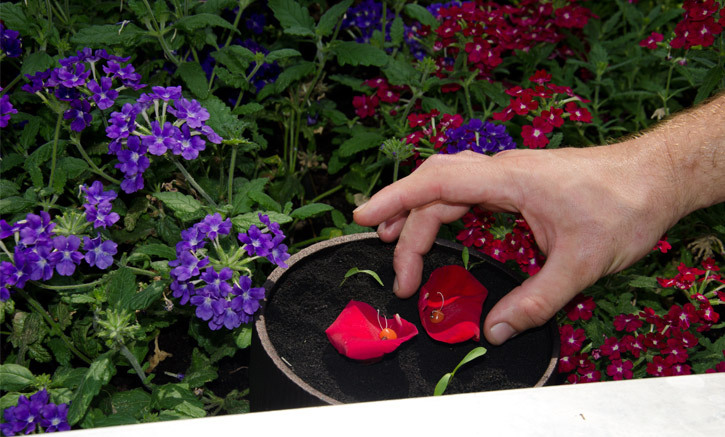 After the greenhouse tour, we were escorted downstairs to the internal garden. 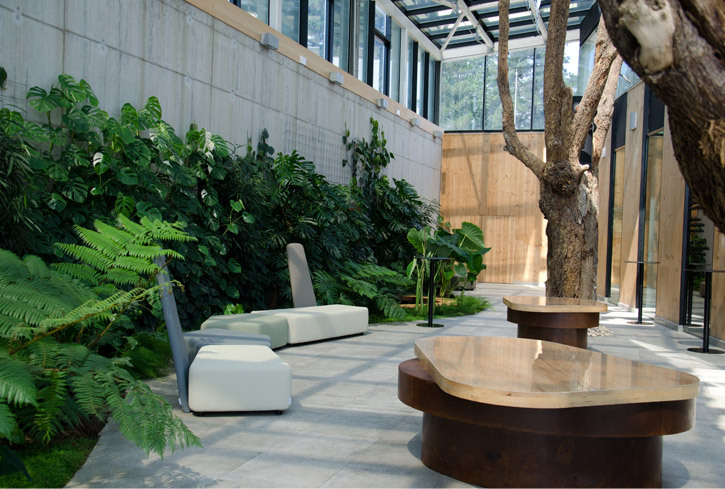 Large trees grow through the top of the building and the entire space is extremely comfortable, which is the goal. They want you to feel as comfortable as if you’re in your own home. 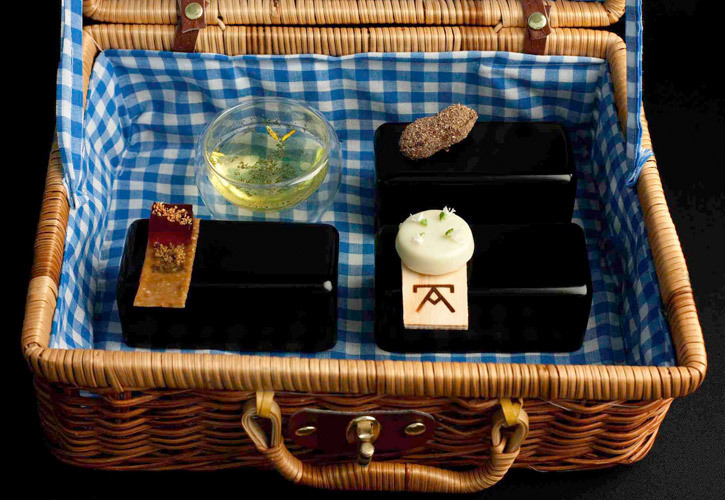 At this point, we were just left alone to relax and enjoy the contents of a small picnic basket containing a few more tastings. The entire process is relaxed and makes you feel very welcome. Next, we were offered a tour of the kitchen and were a bit surprised by the size and organization of it. The modern design has a distinctly contemporary look and feel to it but the biggest anomaly is that there are very few chefs. Unlink most restaurants, chefs aren’t divided into particular sections; instead, each is responsible for several different tasks so that nothing gets boring. After the tour of the kitchen, we were shown to a table so that we could begin our degustation experience. From beginning to end, it was a journey through foods that highlighted both the local bounty and the creativity of this ingenious chef. It’s easy to understand why he earned that 3rd Michelin star! Chef Atxa was generous enough to share some of his recipes with us and we’d like to share them with you. Here are a few of the modernist dishes, along with pictures, that we had the pleasure of experiencing. Recipes coming soon! 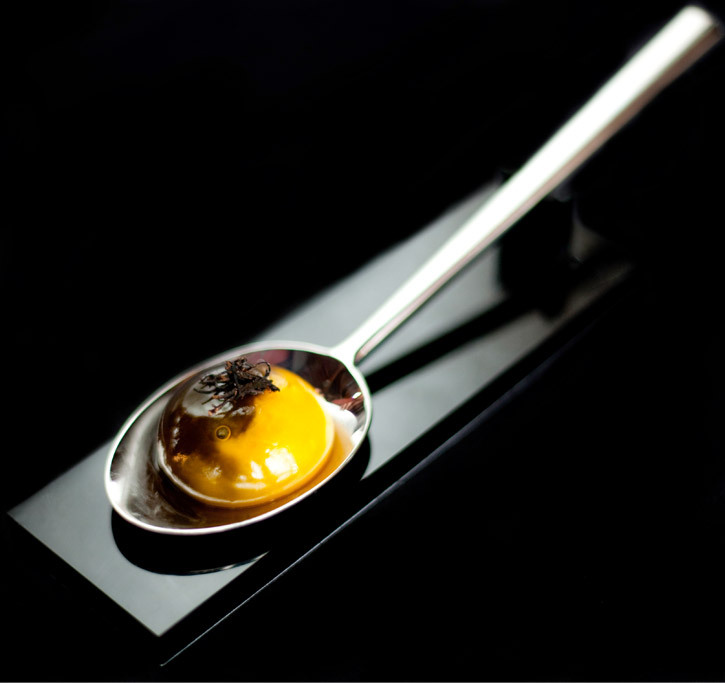 An egg yolk is carefully pierced with a syringe, half of the yolk is extracted and then replaced with hot truffle broth which starts cooking the yolk from the inside. An explosion of flavor! Get recipe here. Delicious! And beautiful presentation! Can't say more. Get recipe here. The creative presentation of this dish will give you a complete sensory experience. Chef Eneko Atxa of Azurmendi has perfected the art of bottling scents in order to add the smell of the sea to this decadent dish. The visual appearance places you tableside by the ocean and the intense flavors just complete the dish. Get recipe here. The rustic appearance of this dish leads you to expect simplicity, but the complexity of this dish will surprise you. 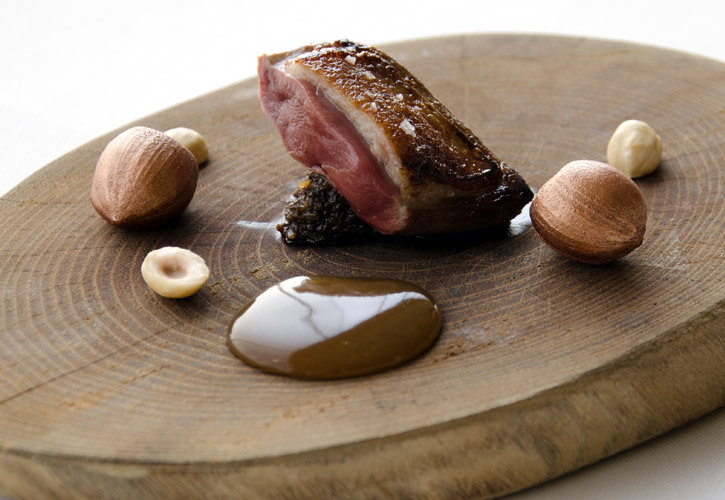 The combination of perfectly-cooked sweet pigeon and nutty hazelnuts play nicely with the earthy tones of the mushroom sauce and the foie gras in the faux hazelnuts. Recipe coming soon!